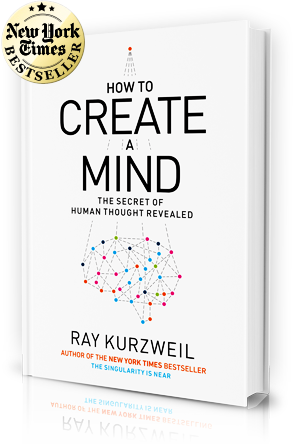 Computer Science Blog: Ray Kurzweil's "How to Create a Mind"
Ray Kurzweil's "How to Create a Mind"
We are not really up to date when it comes to communication technology. The mobile phone that my wife and I possess (yes, one for the two of us) resembles a pocket calculator from the 1980's. Two months ago I had to give a trial lecture for third semester students in computer science on the topic "Introduction to the Development of Mobile Applications". I talked about the new possibilities and challenges in the mobile sector and explained them how the lifecycle of an App in Android works. Overall I think I performed pretty well but I must say that I am very glad that none of the students asked for a demo on my mobile. Anyway, I decided that it is time to change something. I am still not convinced of smartphones, and so instead I got a Kindle Fire HD for my wife Carola for Christmas. To be honest most of the time until now I was using the Kindle. The first e-book I read on the Kindle was "How to Create a Mind" by Ray Kurzweil. Ray Kurzweil is an icon in the Artificial Intelligence (AI) field and has worked for several decades on engineering intelligent systems. He worked a lot in the area of speech and text recognition. The research of his group led to a number of products that can be considered as the state of the art in intelligent systems. The most popular product is probably the Siri assistant that you may know from your iPhone. In "How to Create a Mind", Kurzweil describes the state of the art in AI from a biological, a mathematical, and a philosophical perspective. One of the predominant messages of the book is that it is only a matter of a few decades until machines are more intelligent than humans. Kurzweil gives an overview of the structure of the human brain and describes the core concepts of thinking and learning in the neocortex. He describes thoughts as sequential and hierarchically structured patterns in the brain. An example of the hierarchy of patterns is (spoken) language: phonemes form words, words form sentences, sentences form stories. In a similar way, the brain organizes ideas and concepts into hierarchical structures with increasing levels of abstraction. The sequential and hierarchical structure of patterns in the process of thinking and learning manifests also in the formalism of Hierarchical Hidden Markov Models (HHMMs) which Kurzweil uses and advocates in his book. In their core, HHMMs can be described as structured discrete-time Markov chains with observations. The process of learning involves to find (1) an optimal topology of the HHMM and (2) optimal transition probabilities, based on a training set that is given by sequences of observations. Problem (2) is the actual learning step and can be solved using variants of the Baum-Welch algorithm, whereas (1) can be solved using evolutionary algorithms. was “Who is Attila?”. The showmaster asked him (or it?) to specify the answer and Watson correctly responded with “Who is Attila the Hun?”. Kurzweil makes a point in saying that the understanding of the language used in the Jeopardy! questions (technically answers) is a real challenge and that Watson learned his knowledge by reading the whole Wikipedia and other human-written text resources, which marks a milestone in the engineering of artificial intelligence. "Searle argues that the experience of consciousness can't be detected by examining the behavior of a machine, a human being or any other animal. Daniel Dennett points out that natural selection can not preserve a feature of an animal that has no effect on the behavior of the animal, and thus consciousness (...) can't be produced by natural selection. Therefor either natural selection did not produce consciousness, or (...) consciousness can be detected by suitably designed Turing test." No matter whether you stand on the side of Kurzweil (as I on this question) or on Searle, I hope I was able to whet your appetite. If you are a computer scientist or generally interested in AI, I highly recommend to read "How to Create a Mind" (even if you don't own a Kindle).